A new Chinese weather satellite streaked into space Friday on top of a Long March 3A rocket, China's second flawless space launch this week. The Fengyun 2F spacecraft lifted off at 0056 GMT Friday (7:56 p.m. EST Thursday) from the Xichang space base in southwestern China's Sichuan province, according to the Chinese defense ministry. Liftoff occurred at 8:56 a.m. Beijing time. The 172-foot-tall rocket released the 3,000-pound satellite in an oval-shaped transfer orbit about 24 minutes after launch. State media reported the launch was successful. 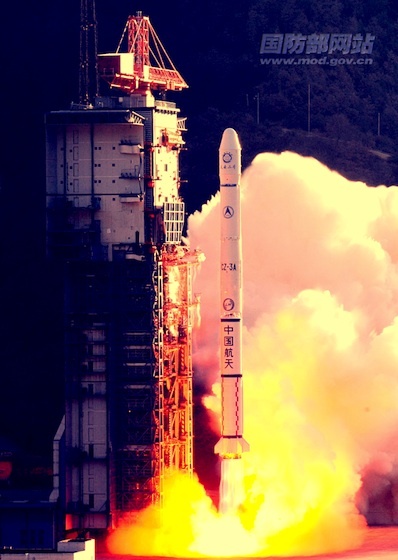 It was the second Chinese space launch this week, coming four days after a Long March 4B rocket hauled a high-resolution mapping satellite into orbit from another space center. Fengyun 2F will enter service for the China Meteorological Administration. The spacecraft will collect real-time weather imagery every 15 minutes for forecasters in China and neighboring countries. In the next few weeks, the satellite will raise its orbit to an altitude of 22,300 miles over the equator and position itself over the equator at 112 degrees east longitude. Fengyun 2F will begin its operational life as a backup satellite, serving with other weather satellites launched in 2006 and 2008. Fengyun 2F features improvements over earlier Fengyun 2-series satellites, including an extension of its design life to four years. The craft carries instruments for visible and infrared high-resolution cloud imagery and for monitoring space weather.